Since 1979, USAHS has been a leader in graduate Physical Therapy education with our focus on professional clinical preparedness. You’ll learn from professors who are practicing clinicians, ensuring that your education will be relevant with a focus on hands-on experience. The USAHS DPT curriculum enables student flexibility by blending online learning components with traditional on-campus, face-to-face learning. As a result, student interaction with faculty and fellow classmates is more meaningful, significant and effective. Our full-time DPT program is for students who are able to attend classes throughout the week at one of our four destination campuses. Small class ratios promoting development of close relationships with both faculty and peers. 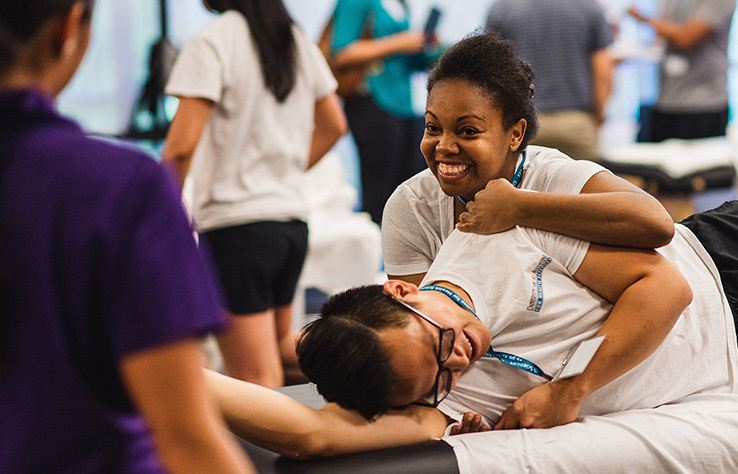 An interdisciplinary educational curriculum where occupational and physical therapy students take classes and work together as commonly practiced in clinical settings. Well-educated and experienced faculty who are attuned to student needs. St. Augustine, San Marcos, Austin and Miami are ideal for student life with excellent recreational and cultural activities. Three clinical internships during the second half of the program deliver critical hands-on experience and patient management skills. One internship is 6 weeks long and the other two are each 12 weeks long and require the student’s full-time participation. Start at the time of year that best suits your schedule. All four of our campuses offer start dates in Jan, May, and Sept. Engage in personal and professional development and lifelong learning activities. Practice physical therapy in a manner that supports cooperative relationships with patients/clients, other health care providers, and the community. Perform evidence-informed physical therapist practice based on foundational knowledge and professional clinical skills. Interact in a professional manner that demonstrates effective communication for various audiences and purposes. Implement principles of ethical and professional behavior in physical therapist practice. Display qualities of leadership in physical therapist practice to advance the profession of physical therapy and the well-being of society. Apply critical thinking to evidence-informed decision making in physical therapist practice.